One of the more common pieces of equipment in the extreme macro photographer's bag is a tripod, but there are cheap tripods and there are good tripods. And a tripod is just the start, you have to consider the tripod head as well. A suitable tripod for extreme macro is a valuable tool helping the photographer to get the shots they're after. A bad tripod is a bulky irritant responsible for putting off even the keenest of enthusiasts. For example the Giotto tripod I have has a loose central collar from a rubber 'O' ring that seems to be missing - grrrrrr. A conventional standard tripod, big, bulky and designed for shooting at about 1m high. But for extreme macro and especially bugs, smaller tripods that can be at almost ground level and don't take up a huge about of space splayed out, are more appropriate. Tripods and heads are not something you want to skimp on. One of the bigger challenges we face in the field is good positioning for a macro image; a tripod is the invaluable tool that'll help you get there. Most beginner's macro shots tend to be of the type 'colourful butterfly on flower on bush', mine included. And of course it's a great thrill to be able to take wildlife images in the garden, with colourful specimens showing off their best poses. Unfortunately they don't always tend to be the greatest shots, as the background often detracts taking the eye towards unwanted busyness. One answer to this is to position the camera differently and isolate the specimen in front of a distant background, which sets off the bug beautifully. Having access to a decent macro tripod to take the weight of a longer macro lens and possibly flash will maximise your ability to use this technique, and it is an absolute necessity when you're stacking images outside or if you're using low light and long exposure times. Stabil wooden tripod. Wood maybe old school, but it absorbs vibration better than metal tripods, looks beautiful and adds a nice bit of weight for stability. What I especially like about these as opposed to the Berlabach ones that look similar is the bendy legs that can be angled as we wish on the Stabil. 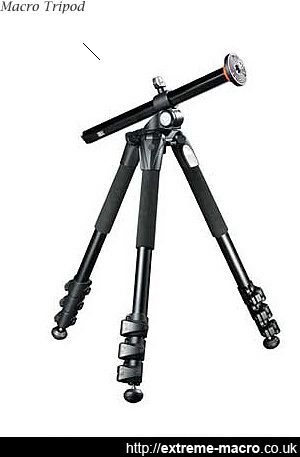 This classy tripod was on my Christmas list last year. Whilst low weight carbon legs maybe the most convenient in terms of weight to carry, I prefer my tripod to be heavy. It's a bit harder work when you're out and about but too bad, it's worth it for sharper shots. In my experience a heavier tripod gives you greater stability, and although the hook on the central pillar with a bag weighing it down on a light tripod can be convenient, this is little use if your tripod is low down on the grass. In any case specialist macro tripods don't necessarily come with a central pillar to hook a bag on anyway, because they are designed to get them really really low on the ground with the legs splayed out. There are all sorts of heads that you can buy but what I've personally done is taken a two arm Giotto head and replaced the bolt that was in place of a third lever with another arm, thus giving me three arms to be able to adjust in any direction. The long arms give excellent precision as per a video pan & tilt and head so this works very well indeed. Pinch-lever ball heads look very tempting for quick positioning, but the feedback from users seems to be that they're not as rigid as you might want them to be and for stacking out in the field you need something as solid as a rock - as it needs to keep quite a heavy arrangement steady (Stackshot, bellows, adapters & optics). I bought a Really Right Stuff BH-55 LR Full-sized ballhead - a beautiful rock solid ballhead for putting a Stackshot on, but eye wateringly expensive. My large tripod has two pillars: one main one like you'd expect from a conventional one and another that can be angled. The second small mini pillar is useful for macro as it lets me fix the camera in unusual positions, for example very low down on the ground. But nevertheless a big tripod is still quite inconvenient for macro as there's a lot of fiddling about and a small one like a Stabil or Berlebach is more convenient for shooting low on the ground. What you actually want in a tripod is as small a central pillar as possible, as this is often the weakest link when it comes to vibration. On the flipside, mounting the central pillar upside down is a way to get down low for macro, although I've never found this to be especially practical. To test the sturdyness of your tripod, mount a long lens, tap a leg and look through the viewfinder. A good use for an old lightweight, relatively useless tripod is as a way to hold your diffusion in the field. Either use some boss clamps or use a standard studio umbrella clams with an old white umbrella to use as sun diffuser. Tripod Manufacturers could do a lot to improve tripods for extreme macro, as we have some unusual needs that are not taken care of well. For example, we like to attach extra arms to tripods to keep stems of grass still, or hold up reflectors and/or light sources, be they continuous LED panels or flashes. I'd urge the innovative tripod manufacturer to come out with a decent model that allows full and easy panning, a rock solid lock, and a way to add attachments like these that make some sense in the field. This is known to experienced photographers but it is worth repeating. To get the best out of your tripod, do not adjust height using the centre column but extend the legs further out instead. Leave the centre column as low down as possible. The centre column is supported by one column only and extending this will make your tripod prone to vibration. Does anyone have any experience with a geared tripod head? I noticed Benro and Manfrotto both make a few different models. It seems like it might be a good option for something steady and precise? I'm curious how precise you can actually get though? I have a pretty heavy duty ball head but with a bellows and 5x objective i still have a hard time positioning. I get some sag and settling every time i aim the camera. It settles but maybe gears to slowly adjust angles is better?